UPDATE, 7:40 p.m., Sept. 14, 2017: 24 hours after UM announced a slew of dates when classes will resume and changes to the fall semester’s academic calendar, a new advisory sent out today details the school’s recovery progress. The 11th alert, now called a storm recovery alert, said the university has made “significant progress in the recovery process” that includes collecting debris that would “fill 800 pickup trucks.” As a result, all classes will resume on the medical campus as well as graduate classes on the RSMAS campus. According to today’s alert, power has been restored in nearly all of the Coral Gables campus. In the Sept. 13 storm alert, the UM community was informed that several major campus buildings were still without power including residential colleges. The Lennar Foundation Medical Center will open tomorrow from 11 a.m. to 4 p.m.
UPDATE, 8:00 p.m., Sept. 13, 2017: The University has announced a list of dates when classes will resume on its multiple campuses. According to a Storm Alert sent Wednesday evening, RSMAS graduate students, faculty and staff will return to campus on Monday, Sept. 18. Graduate classes at RSMAS will resume that day. Medical classes will also resume Sept. 18. At the Gables campus, Law school classes will resume on Wednesday, Sept. 20. All other classes on the Gables campus will resume on Monday, Sept. 25. All residential colleges and the University Village will reopen Friday, Sept. 22. Family Weekend activities are canceled for Sept. 23-Sept. 24. Fall Break will be canceled on Oct. 12-Oct. 13. Fall classes will continue until Dec. 20. Commencement will remain on Dec. 14, which is also the new Reading Day for exam periods. The alert also stated that essential Coral Gables faculty and staff are expected to report to their regular work schedule “at the direction of their department supervisor” Monday, Sept. 18. The university began its clean up process on Monday, Sept. 11, and at the time, found “major safety hazards.” University of Miami’s Coral Gables and RSMAS campuses have remained closed. According to the advisory, several major campus buildings including residential colleges remain without power. Director of Emergency Management Matthew Shpiner said the university is working around the clock with over 20 departments to ensure students are back on campus as quickly as possible. UPDATE, 6:38 p.m., Sept. 12, 2017: Coral Gables and Rosenstiel faculty and staff are currently expected to report to their regular work schedules on Monday, Sept. 18, according to a university storm alert sent Tuesday night, Sept. 12. Initial damage assessments of Coral Gables and RSMAS campuses began yesterday morning and were completed today. There are “substantial infrastructure and power issues, as well as significant tree damage and debris to the interior” of both campuses, according to the storm alert. The university is also expected to announce a revised academic calendar in the near future. UPDATE, 5:41 p.m., Sept. 12, 2017: Nearly a week after UM announced the cancellation of classes in preparation for Hurricane Irma, administrators will decide when to resume classes tomorrow, Sept. 13. Vice President for Student Affairs Patricia Whitely said senior leadership, including President Julio Frenk and herself, spent “a good part of the day touring campus and working closely with our facilities team, assessing campus damage.” The Rosenstiel School of Marine and Atmospheric Science (RSMAS) was assessed for damage today. Tomorrow, administrators will also decide when residential halls will reopen to students. Normal operations at the University of Miami Health System and medical school, except for medical schools classes, will resume tomorrow, Sept. 13. Though campus remains closed and students have been advised to avoid the area, an ENN Alert released earlier today announced the re-opening of Mahoney/Pearson, Pavia and Merrick Garages. Only students who have vehicles parked inside the garages are allowed to enter. Individuals picking up vehicles were asked to stop by the Metrorail parking lot for pick up instructions before retrieval. According to Whitely, the students who were relocated to a nearby shelter on Sept. 8 have returned to campus. They will be relocated to a hotel in Coral Gables this evening. Whitely said the students will be provided two meals a day at the Hecht – Stanford Dining Hall. The students will be transported by shuttle. A storm alert, the university’s ninth advisory, is expected to be sent out later tonight with more information on damage assessments and adjustments made to the fall 2017 academic calendar. The earliest classes will begin remains Monday, Sept. 18. UPDATE, 10:25 a.m., Sept. 11, 2017: Initial damage assessments of all University of Miami campuses have begun. The university sent out an ENN Alert earlier this morning. The alert stated that “major safety hazards” had been identified after an initial assessment of the Coral Gables and Marine Campuses. Vice President for Student Affairs Patricia Whitely said this morning President Frenk, UMPD officials and UM Facilities personnel began their tours of campus. She said the assessments will continue through today and tomorrow. UM campuses are closed. As of now, the earliest classes will resume is still Monday, Sept. 18. “I think our concern is that, there are trees down and there are paths that are not able to get through and when you have, having gone through Andrew, Katrina and Wilma, you don’t want people in the way of your construction crews that are trying to clear the path,” she said. 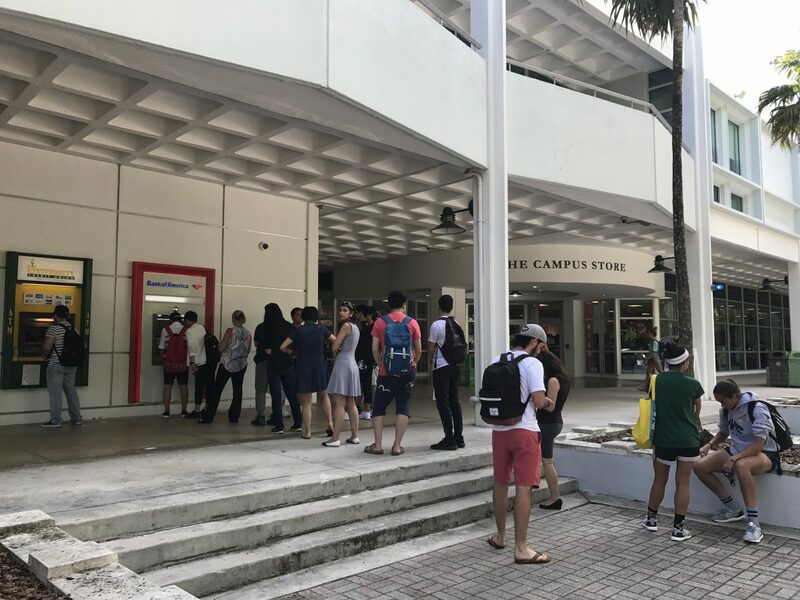 Whitely said UM students evacuated to a nearby shelter on Friday never lost power and have been able to be fed hot meals throughout the storm. She said her objective is to relocate those students back onto campus Tuesday. UPDATE, 2:28 p.m., Sept. 10, 2017: The university has sent out a new advisory that announced classes would resume on Monday, Sept. 18, at the earliest. The fall academic calendar is currently undergoing revision. Vice President for Student Affairs Patricia Whitely said that this was a joint decision made by administration and emergency management personnel for the Coral Gables and RSMAS campuses. The medical campus and the University of Miami Health System will make their own decisions. Millions are currently without power in Miami, and the campus did not have power as of 12:45 p.m.
Whitely called the decision “a prudent course of action that is sensitive to the needs of students, faculty and staff.” Students should expect flights and travel to Miami to be restricted this week. The remaining UM students who were evacuated to a nearby shelter on Friday still have power at their shelter, Whitely said. The students will ideally return to campus on Tuesday. However, residential colleges are not expected to open before the end of the week. UPDATE, 7:07 p.m., Sept. 9, 2017: The City of Coral Gables has issued a curfew in evacuation zones (A, B and portions of C) from 8 p.m. Saturday to 7 a.m. Sunday. Several other cities have issues curfews, but Miami-Dade County Mayor Carlos Giménez has not issued a sweeping curfew for the whole county. Tornado warnings are in effect and a large tornado is making its way through Broward County. UPDATE, 5:38 p.m., Sept. 9, 2017: Hurricane Irma has begun its expected turn to the west-northwest and is strengthening, according to the latest advisory from the National Hurricane Center. Irma is expected to become a Category 4 storm and be in Florida overnight and all day Sunday. UPDATE, 1:10 p.m., Sept. 9, 2017: Hurricane Irma has been downgraded to a Category 3 with maximum sustained winds of 125 mph. The storm’s interactions with northern Cuba have weakened it, but Irma is expected to strengthen again as it makes a north-northwest turn toward the Florida peninsula. The Florida Keys are expected to be affected on Sunday morning. A curfew was established in the City of Miami from 7 p.m. Saturday to 7 a.m. Sunday. Several areas in Florida are already being affected by strong winds, rain and loss of electricity. Some models predict Hurricane Irma will miss the metropolitan Miami area and go up the west coast of Florida, but that will be better determined as the storm begins its turn to the north-northwest. There is the possibility of tornadoes tonight and tomorrow in southern Florida. On the University of Miami Coral Gables campus, administration and emergency personnel are in the Emergency Operations Center until the storm passes. 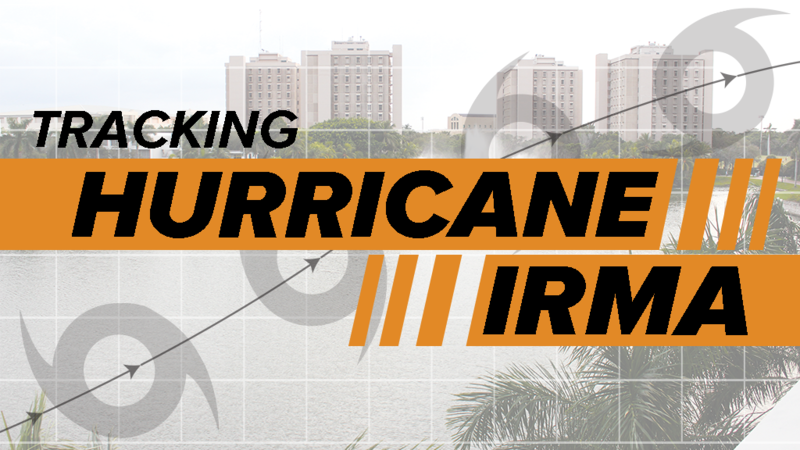 UM President Julio Frenk says the university plans to assess damages on campus on Monday morning, but that may change depending on the progress and severity of the storm. UPDATE, 2:25 p.m., Sept. 8, 2017: All University of Miami campuses will remain closed on Tuesday, Sept. 12, including all UHealth clinical operations, according to a university hurricane advisory sent out Friday afternoon. The university has completed its storm preparations to protect campus facilities, and the campus is expected to be surveyed on Monday for damage. Hurricane Irma has downgraded to a category 4 storm, with sustained winds of 150 mph. UPDATE, 8:20 a.m., Sept. 8, 2017: The remaining on-campus residents will be evacuated Friday afternoon to a student hurricane shelter about five miles from the Coral Gables campus. University administrators and emergency management personnel will remain on campus during the worst of the storm, in the Emergency Operations Center on Ponce De Leon Boulevard. Large swaths of Florida are under hurricane watch as of Thursday. Hurricane Irma is tightening its bullseye on the Florida Peninsula and another storm is developing in the Atlantic – Hurricane Jose. Jose is trailing in Irma’s path and threatening to strike some of the same badly devastated regions in the Caribbean for a second time. Officials have stressed that by Friday night, South Floridians should be prepared for the storm. That includes deciding whether or not to evacuate from zones where it is not mandatory. UPDATE, 8:20 p.m., Sept. 7, 2017: All University of Miami campuses will remain closed on Monday, Sept. 11, including UHealth clinical operations on the medical campus, according to a hurricane advisory that was sent out Thursday evening. Hurricane Irma has caused extensive destruction in the Caribbean, where it made landfall on Wednesday. The hurricane is expected to travel west-northwest today and is projected to turn north near Florida and follow the east coast of the peninsula, possibly affecting Georgia and South Carolina. Mandatory evacuation orders are underway in Miami Beach. Irma will likely remain a Category 5 storm over the next two days, according to the National Hurricane Center. The Coral Gables and RSMAS campuses closed at the end of day Wednesday and will remain closed at least through Sunday, September 10, except for essential personnel identified as part of the UReady Continuity Plan, according to a university statement. Housing and dining halls will remain open, but other facilities on the campuses will be closed during this period. UPDATE, 10:05 a.m., Sept. 6, 2017: The university is urging students to leave South Florida by the end of Thursday. Students who do not evacuate the campus may be required to evacuate to an off-site evacuation center “that only serves as a refuge of last resort and has the most basic of accommodations,” according to a university storm alert. Here is a list of evacuation shelters in Miami-Dade County. Are you evacuating South Florida? Are you staying in place? Email editor@themiamihurricane.com. Students on campus began taking preparations on Tuesday. There was a line by one of the campus ATMs. And now that classes are cancelled, students are scrambling to find flights home. Prices are high because of the demand. Senior Adriana Gonzalez booked her flight to Mexico City on Tuesday afternoon after she found out classes were cancelled. She said roundtrip flights cost about $500 when she was searching, which is much more expensive than usual. Gonzalez said she had only ever experienced Hurricane Matthew. Abby Mintz, a sophomore biology major from New Jersey, was able to book a flight home on Tuesday afternoon – for $1.300. Ashley Plotkin, a sophomore political science and economics major, was also able to book a flight home to New Jersey. Plotkin said she paid just under $700 for her round trip flight, but she’ll be traveling almost 15 hours. She will be flying from Miami to Orlando, spending the night in the airport, then flying to Charlotte, North Carolina and then to Newark Liberty International Airport. UPDATE, 1:50 p.m., Sept. 5, 2017: Classes are cancelled on Wednesday, Thursday and Friday on the Coral Gables campus and the Rosenstiel School of Marine and Atmospheric Science campus, according to a university alert sent out around 1:30 p.m. Tuesday. Many students have already booked flights and made other travel arrangements to leave Miami. The university will also begin shuttering and sandbagging the campus starting tomorrow. 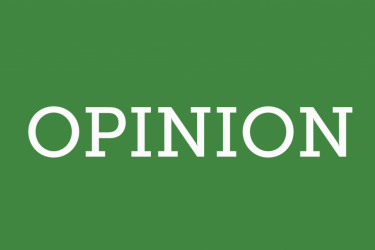 The Canes Emergency Response Team (CERT), which is a network of student volunteers trained to respond to emergency situations on campus, will be mobilized if need be, but it has not been yet. The hurricane emergency hotline is activated at 1-800-227-0354 and will open until 8 p.m. tonight and starting at 8 a.m. tomorrow morning to answer any questions students may have. Whitely said the university is at least 72 hours away from making a decision about whether or not to evacuate campus. 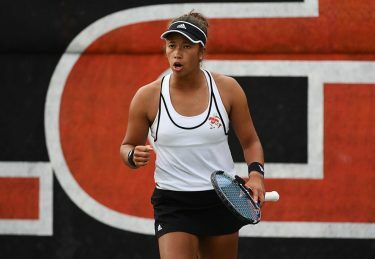 However, Whitely said, she has “full confidence” that the university could house and feed students. The dining halls will remain open unless the winds become too powerful for students to be walking around, in which case prepared meals will be delivered to the dorms. Hurricane Irma is now a Category 5 storm barreling its way through the Atlantic Ocean with the potential of hitting South Florida. The National Hurricane Center upgraded Irma’s strength to a Category 5 storm on Tuesday morning. Areas southwest of Florida such as the U.S. Virgin Islands and Puerto Rico are under Hurricane Watch. University of Miami policy dictates that class cancellations would go into effect if the city is expected to experience tropical storm-force winds (39 mph or higher). There have been no changes made to university operations or events, but university administration will meet several times today to discuss plans for the rest of this week. 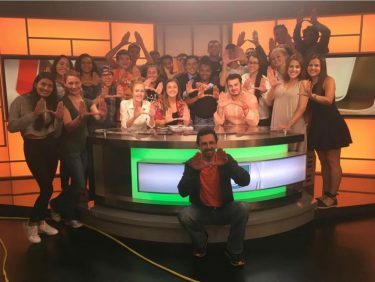 It has been nearly a year since UM canceled and closed all operations, classes and events because of a hurricane threat. In October 2016, Hurricane Matthew, a Category 3 storm, brought tropical storm winds to Miami-Dade County. After two days, the worst of the hurricane had passed and the school resumed normal operations. UM alumnus and meteorologist Reed McDonough tracked Hurricane Matthew last year and is tracking Hurricane Irma now. McDonough, who works for an NBC affiliate in Erie, Pennsylvania, said Miami residents should expect to know whether they will be affected by the storm within the next 24 to 48 hours. However, he said students should begin preparing now. McDonough said the current forecast model for the storm is putting it “south between Cuba and the Florida Keys” because of a high pressure system in the Atlantic Ocean that is pushing the storm in that direction. However, McDonough said the pressure system could weaken and curve the storm north toward Miami, but it could change course “last second” and miss it. The Office of Emergency Management will be posting regular updates at facebook.com/umiamiENN and @umiamiENN on Twitter. More hurricane preparation information is available on the OEM webpage.